The recruitment game is changing daily. With the ever-present risk of losing talent to faster moving companies, recruiters feel the increased pressure to escalate candidates through the process quicker than ever, and must adopt more ways to source and engage talent. Building and nurturing a candidate pipeline is key to your company’s long-term recruitment strategy. To successfully attract these candidates, you need to authentically capture their interest. 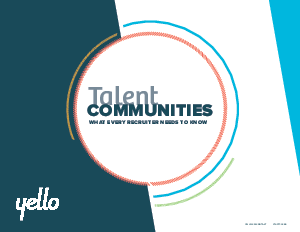 Creating a talent community can help you stay in touch and nurture relationships with potential applicants, to initiate a positive candidate journey with your company.